Variety most frequently used for making the delicious fragrant pies and jams we all know and love! Fruits are packed with juice and the skin colour is dark red. It is one of the most reliable croppers of all the sour cherries. It is self-fertile, late flowering, less susceptible to frost damage and incredibly disease resistant. Supplied in a 5L pot. 'Morello' Cherry is often referred to as 'The Cooking Cherry' because it is the variety most frequently used for making the delicious fragrant pies and jams we all know and love! The fruits are packed with juice and the skin colour is dark red. 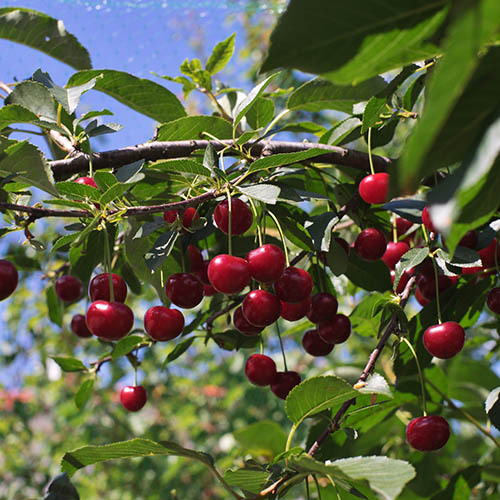 It is one of the most reliable croppers of all the sour cherries because it is self-ertile, late flowering and so less susceptible to frost damage, plus it is incredibly disease resistant a real winner for any garden! 'Morello' Cherry is also a great tree to grow on a north-facing wall because even in a cooler position with low light levels it will still grow and thrive and fruit as normal you can usually expect to pick the fruits from late August onwards.